I wake up to an inbox full of press releases every morning as part of my work editing Where Rome magazine. To be perfectly honest, the majority of them go straight in the trash after a quick skim—either they aren't of interest to my readers, or the event in question is already out of date (I write up to two months out, so I need lots of advance notice). The releases that I do find pertinent get filed away for future reference. Rarely do I ever receive a release that makes me gasp out loud. But it happened a few months ago. So after that long preamble, what event is it that got me so hot and bothered? 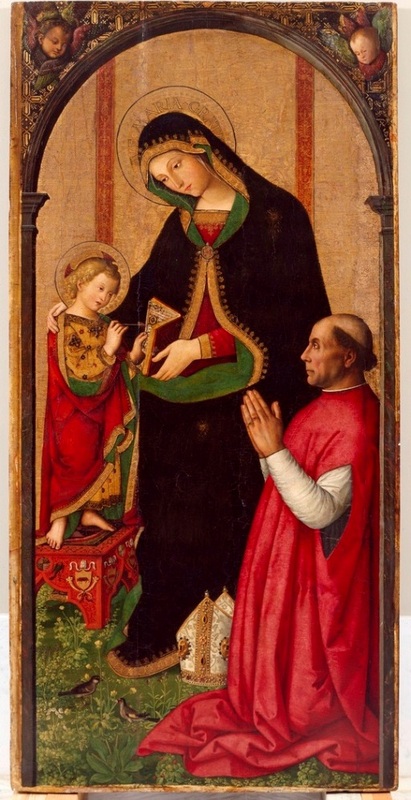 Well, perhaps some of my most faithful bloglings remember the post I did on The Borgia Pope, Pinturicchio, and Giulia Farnese way back in 2012. I’m a little obsessed with the Borgias, and I’m very obsessed with art history mysteries. So when I heard that the Capitoline Museums were displaying a rare work by Pinturicchio called Baby Jesus of the Hands (which is actually a fragment of a larger work that is now lost), I was thoroughly intrigued. Check out that post for the full story on the fascinating mystery of that controversial (and eventually mutilated) work of art. When, five years later, the very same Capitoline Museums announced in the above-mentioned press release that not only was the elusive Baby Jesus of the Hands going on display once again, but that it would be presented alongside Pietro Fachetti's rarely seen copy of Pinturicchio’s full work, The Divine Investiture of Alexander VI, giving much needed context to the beautiful Baby Jesus of the Hands fragment, it was all I could do to contain my excitement. The exhibit includes works of art depicting some of the Borgia clan's most infamous members such as the ruthless Cesare, the sensuous Lucrezia, the courtesan-turned-matriarch Vannozza Cattanei, the papa cattivo himself Rodrigo, and another fragment of Pinturicchio's original work, containing the face of Giulia herself. Also on display are additional works by Pinturicchio, a number of ancient Roman sculptures, Renaissance maps and engravings that shed light on what Rome looked like during the time of the Borgias, and even an original copy of Giorgio Vasari's The Lives of the Artists. The exhibit is still on, dear readers and fellow art lovers, but not for long. So if the story of the Borgia Pope, his lovely young mistress Giulia Farnese, and the painting that immortalized them and their baby daughter Laura is as intriguing to you as it is to me, I suggest you get yourself to the Capitoline Museums post haste. Pinturicchio, Painter of the Borgias: The Mystery of Giulia Farnese Revealed is only on until 10 September 2017! Below is a selection of the works on display. All images provided courtesy of Roma Capitale - Sovrintendenza Capitolina ai Beni Culturali-Assesorato alla Crescita Culturale.